Look for this beer and more and Full Throttle Bottles! 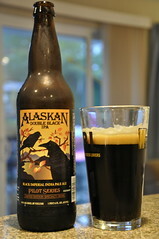 Intro: Next up in the Alaskan Pilot Series is their Double Black IPA. If you aren’t familiar with the black IPA style, it is exactly what it sounds like: a beer that has the hop profile of an IPA but looks like a porter or stout. For the Double Black IPA, think along the lines of a mix between an imperial IPA and an imperial stout. Description: Pours a very dark brown with medium head. Beautiful citrus aroma hopping out of the glass. Taste starts off with a mix of smooth fruity hops mixing with dark roasted malts. A significant kick of alcohol taste comes out midway through, and the finishing bitterness just barely balances the beefiness of the malt and alcohol. As this is my first experience with a “double black” IPA, I guess I’m not too surprised that this is similar to some of the hoppy imperial stouts that I’ve tried in the past. It’s really enjoyable, but don’t expect it to be as light and drinkable as your typical black IPA. As the days get darker and cloudier here in Seattle, this is feeling pretty appropriate. Alaskan Double Black IPA is the latest in the Brewery’s Pilot Series of limited-edition specialty beers. The new brew features a combination of beer styles, with a flavor profile most similar to an Imperial IPA and the dark black color and rich flavors usually found in heartier stouts and porters. Brewed with an array of dark malts, Alaskan Double Black IPA features the distinctive flavors of coffee and bitter chocolate with a subtle toasted sweetness. Large Cascade and Centennial hop additions late in the boil, and dry-hopping after fermentation, lighten and refresh the overall perception and flavor of the beer. It finishes with a dry palate and lingering citrus bitterness. Alaskan Double Black IPA is the second release in the Brewery’s “Pilot Series,” a rotating collection of distinctive brews packaged in 22 oz bottles that has included Alaskan Baltic Porter, Alaskan Raspberry Wheat and will include a new release of Alaskan’s World Beer Cup-winning Barley Wine in December 2010. These and all of Alaskan’s specialty release beers are available in limited quantities throughout the western states. Stay tuned to AlaskanBeer.com and facebook.com/AlaskanBeer for updates and information about new releases and what is happening with the Alaskan Brew Crew.